� The white PV display with a height of 15.2 mm improves visibility. � Short body with depth of only 60 mm. � Set up the Controller without wiring the power supply by Refer to Safety Precautions on page 50. Current input: 150 max., Voltage input: 1 M min. Contact input: ON: 1 k max., OFF: 100 k min. Event input External contact input Non-contact input: ON: Residual voltage: 1.5 V max., OFF: Leakage current: 0.1 mA max. SP SP SP by the deviation or more. SP the SP by the deviation or more. 8 it OFF PV OFF 0 PV alarm value (X) regardless of the set point. 9 Absolute-value lower-limit PV OFF 0 PV alarm value (X) regardless of the set point. 14 SP OFF 0 SP is higher than the alarm value (X). 15 SP OFF 0 SP is lower than the alarm value (X). 16 Heating/Cooling Heating/Cooling variable (MV) is higher than the alarm value (X). lower-limit alarm *9 Control (Cooling MV) Control (Cooling MV) variable (MV) is lower than the alarm value (X). 18 RSP 0 RSP (RSP) is higher than the alarm value (X). 19 RSP 0 RSP (RSP) is lower than the alarm value (X). independently for each alarm type, and are expressed as "L" and "H."
Case 1 Case 2 Case 3 (Always ON) H<0, L<0 Always OFF when the upper-limit and lower-limit hysteresis overlaps. |H| |L| Always OFF when the upper-limit and lower-limit hysteresis overlaps. *3 Set value: 4, Upper- and lower-limit range *6 Refer to the E5@C Digital Temperature Controllers User's Manual (Cat. No. H174) for information on the operation of the standby sequence. L H SP SP L H H SP L H<0, L>0 No.H174) for information on the loop burnout alarm (LBA). |H| < |L| |H| > |L| *8 Refer to the E5@C Digital Temperature Controllers User's Manual (Cat. No. H174) for information on the PV change rate alarm. Analog input: �0.2% FS �1 digit max. CT input: �5% FS �1 digit max. Transfer output accuracy �0.3% FS max. Remote SP Input Type �0.2% FS �1 digit max. Influence of temperature *2 Thermocouple input (R, S, B, W, PL II): (�1% of PV or �10�C, whichever is greater) �1 digit max. Platinum resistance thermometer: (�1% of PV or �2�C, whichever is greater) �1 digit max. Analog input: �1%FS �1 digit max. Remote SP input: �1% FS �1 digit max. whichever is greater) �1 digit max. The indication accuracy of PL II thermocouples is �0.3% of PV or �2�C, whichever is greater, �1 digit max. *3 K thermocouple at -100�C max. : �10�C max. Applicable software CX-Thermo version 4.5 or higher are set as slaves. Connector Computer: USB (type A plug) ature Controllers that are set as slaves. specifications Digital Temperature Controller: Slope and offsets can be set for the set point. 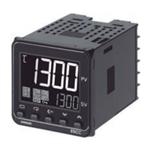 4.7�0.2 VDC * A Temperature Controller with version 1.1 or higher is required. Output current 250 mA max. procedure. Heater burnout �5% FS �1 digit max. Flow control Vertical parity (none, even, odd) detection current value). Retry function None *4 The value is 35 ms for a control period of 0.1 s or 0.2 s.
12 VDC, 21 mA (resistive load) not agree with the temperature sensor. Check the input type. Press O Key for at least 3 seconds to go to Initial Setting Level. Use the M Key to change to another parameter. (Sold separately) � Recommended panel thickness is 1 to 5 mm. make the connection. waterproof packing onto the Controller. Conversion Cable for the connection procedure. Note: Do not leave the USB-Serial Conversion Cable temperature specified in the specifications. Waterproof Packing The Waterproof Packing is provided with the Temperature Controller. Y92S-P8 (for DIN 48 � 48) Order the Waterproof Packing separately if it becomes lost or damaged. Adapter Note: 1. Use this Adapter when the Front Panel has already been prepared for the E5B@. E5CC to a DIN Track. � Tool ports are provided both on the top panel and the front panel. � High-speed sampling at 50 ms. information on applicable safety standards. � Easy connections to a PLC with programless communications. � The new position-proportional control models allow you to control valves as well. � Pt at the same time. Note: Always use this product together with the E58-CIFQ2. Note: CX-Thermo version 4.5 or higher is required for the E5EC. Potentiometer input Non-contact input: ON: Residual voltage: 1.5 V max., OFF: Leakage current: 0.1 mA max. |H| < |L| |H| > |L| |H| |L| Always OFF when the upper-limit and lower-limit hysteresis overlaps. SP H L |H| |L| *6. Refer to the E5@C Digital Temperature Controllers User's Manual (Cat. No. *7. Refer to the E5@C Digital Temperature Controllers User's Manual (Cat. No. used with a position-proportional model. H<0, L>0 H>0, L<0 H L SP |H| |L| *8. Refer to the E5@C Digital Temperature Controllers User's Manual (Cat. No. |H| < |L| |H| > |L| H174) for information on the PV change rate alarm. 23�C) Analog input: �0.2% FS �1 digit max. Potentiometer input: �5% FS �1 digit max. any temperatures is �2�C �1 digit max. The indication accuracy of the B thermocouple at a temperature of 400�C max. indication accuracy of PL II thermocouples is (�0.3% of PV or �2�C, whichever is greater) �1 digit max. Transmission line RS-485: Multidrop Input current indica- �5% FS �1 digit max. Block check character (BCC) with *3. The value is 30 ms for a control period of 0.1 s or 0.2 s.
CompoWay/F or CRC-16 Modbus *4. The value is 35 ms for a control period of 0.1 s or 0.2 s.
Linear current output Load: 500 max. TC Pt I V a gray background. 45+0.06 (48 � number of units - 2.5)+10.0 group mounting, the ambient temperature must be 45�C or less. � Recommended panel thickness is 1 to 8 mm. Mounted Separately Group Mounted * � Recommended panel thickness is 1 to 8 mm. Group mounting does not packing onto the Controller. Y92S-P10 (for DIN 96 � 96) of the E5EC/E5AC securely closed. Check the required period in the actual application. � Removable terminal block for easy replacement to simplify maintenance. � A white PV display (height: 8.5 mm) is easy to read when setting up, information on applicable safety standards. inputs Contact input ON: 1 k max., OFF: 100 k min. External contact input Non-contact input ON: Residual voltage 1.5 V max. ; OFF: Leakage current 0.1 mA max. Case 1 Case 2 Case 3 (Always OFF) � In case 3, the alarm is always OFF. Case 1 Case 2 Case 3 (Always ON) |H| |L| (Cat. No. H174) for information on the LBA. H L SP (Cat. No. H174) for information on the PV change rate alarm. Indication accuracy Thermocouple:*1 (�0.3 % of PV or �1�C, whichever is greater) �1 digit max. ent temperature of 23�C) Platinum resistance thermometer: (�0.2 % of PV or �0.8�C, whichever is greater) �1 digit max. Analog input: �1% FS �1 digit max. Installation influence (E5DC only) R, S, B, W, or PLII thermocouple: (�1% of PV or �10�C, whichever is greater) �1 digit max. not specified. The indication accuracy of B thermocouples at a temperature of 400 to 800�C is �3�C max. thermocouples is (�0.3% of PV or �3�C, whichever is greater) �1 digit max. The indication accuracy of PLII thermocouples is (�0.3% of PV or �2�C, whichever is greater) �1 digit max. *3 K thermocouple at -100�C max: �10�C max. Applicable OS Windows 2000, XP, Vista, or 7 Programless E5@C parameters, start and stop operation, etc. Current consumption 450 mA max. Output current sion Cable to the Digital Temperature Controller.) Temperature Controllers that are set as slaves. Altitude 2,000 m max. set as slaves. Weight Approx. 120 g Slope and offsets can be set for the set point. * A Digital Temperature Controller with version 1.0 or higher is required. * Use a high-power port for the USB port. Baud rate 9,600, 19,200, 38,400, or 57,600 bps Input current �5% FS �1 digit max. E5DC Auxiliary outputs 1 and 2 The E5DC is set for a K-type thermocouple (input type = 5) by default. Control output Relay outputs with the temperature sensor. Check the input type. � To attach the USB-Serial Conversion Cable to the control panel, use a panel thickness of 1 to 2.5 mm. communications, etc.) when you use multiple E5DC Controllers. Press the O Key or the for operations. O Key once. adjustment sensitivity, etc.). Used to set the input type (models with communications only). O Key once. Used to set communications. Stopped. Release protection and then Press the O Key for at least 1 s.
The sensor is disconnected or short- type. exceeded. The sensor is not wired correctly. or input type settings, cycle the output exceeded the upper limit. Temperature resistance Controller. error occurs. then the probable cause is external display for the PV. SP Lower Limit - 20�C to SP Upper noise affecting the control system. Limit + 40�F) Note: For a temperature resistance OFF.
]]]] range Above 9,999 control range is wider normal. range and the PV for the PV. e111 error controller must be repaired. OFF. (A current output will be approx. lcr1 current exceeds 55.0 A. If the display remains the same, the OFF. (A current output will be approx. system. Check for external noise. normal. (Position- performed. or Adjustment Level. MV at PV Error parameter is output. C 25 PID Key or the S Press the Press the O Key for less than 1 s.
Press the O Key less than 1 s.
ON Delay M output cycle. 0 wt-b Wait Band M at least 3 s. for at least 1 s. less than 1 s.